Gonidec Sardines for sale. Buy online at Zingerman's Mail Order. Gourmet Gifts. Food Gifts. 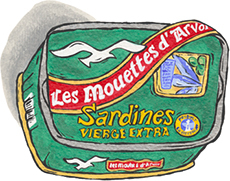 These wonderful, traditionally prepared sardines are packed by the Gonidec family in the old Breton port town of Concarneau under the name Les Mouettes d’Arvor. Currently in their third generation—a relative newcomer next to Connétable—they remain true to old methods. The fish are fresh, never frozen. As per the old Breton way, the newly landed sardines go into a bath of ice and salt water. Called "pickling" this process firms the flesh of the fish. The fish are then laid out on racks and dried slowly in kilns then fried. Drained, they're hand packed in extra virgin olive oil.